Sooo several months after you started posting pics of vegies I finally work out what you're talking about. 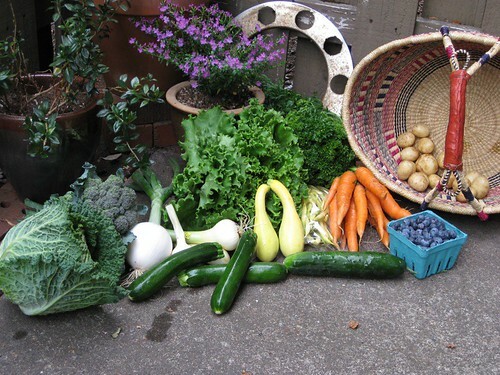 How did you get involved in a CSA? I know they are pretty widespread in America but they have yet to take of here in Aus. I'm in a group of friends who buy take turns to buy bulk vegies at the farmers market every fortnight and distribute boxes. There have been a few mentions of wanting to start up a CSA in our group, I've noodled about wiki for some info and it sounds like an awesome idea. I've got no real concept of how hard it is to set up though. Just Food in NYC supports CSAs throughout the city here. They helped us start ours in Brooklyn Heights and it wasn't too terrible. Though it would probably be harder without the support - Just Food provided us with workshops on the various how-to's and supported us as we pulled our stuff together and got off the ground in 2007. Local Harvest would probably be a good place to start - they may be able to hook you up with someone similar in your city.